Jaipur is a world famous tourist destination, known for its history of Maharajas and their royal lives. Filled with opulent forts and palaces, as well as scenic lakes and outdoor settings, Jaipur is a wonderful location for a balloon ride. 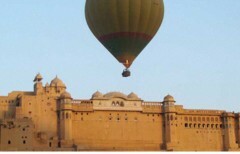 Depending on the weather, your ballooning route might be in the north of Jaipur, in the skies above Amber Fort and village. If the winds are favourable, you could instead be flying over Samode Palace and village. The route taken heavily depends on the weather and wind conditions at the time of your flight. The ballooning pilot chooses the launch site and flying route according to weather conditions, to ensure a safe and enjoyable flight for everyone on board. 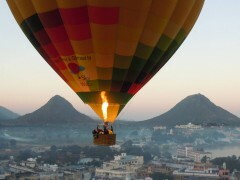 • Enjoy a hot air ballooning flight in Jaipur. 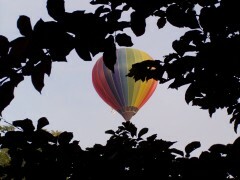 • Experience the thrill of flying in a basket suspended under a giant balloon. 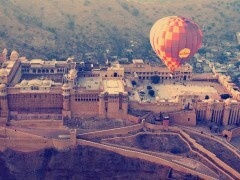 • Get bird's eye views of Jaipur, the Pink City of India. • Spend a day doing something you've never done before. 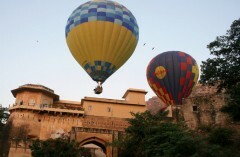 Travellers are required to follow instructions of the tour guide while hot air ballooning in Jaipur. Travellers are allowed to carry small backpacks and handbags only. Extra luggage will be allowed only at the discretion of the tour operator. 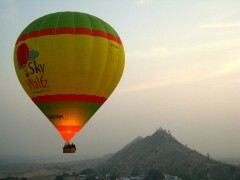 For cancellations made 15 days or more before the departure of hot air ballooning in Jaipur: 100% refund. 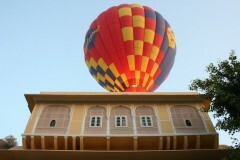 For cancellations made 3-14 days before the departure of hot air ballooning in Jaipur: 75% refund. 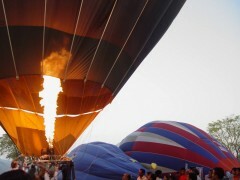 For cancellations made less than 3 days before departure of hot air ballooning in Jaipur: no refund. For bookings cancelled due to bad weather, travellers can opt for a 100% refund or reschedule the flight to another available date. Bookings for children under the age of 5 are not charged. Bookings for children aged 5-12 years is charged at a discounted price of INR 8,260 per child. Bookings for children older than 12 years is charged at full price. Children under the age of 16 need to be accompanied by adults. Bookings for non-Indian citizens are charged at $280 per person for adults and $165 per child for children aged 5-12 years. Price may be subject to international payment transfer fees. 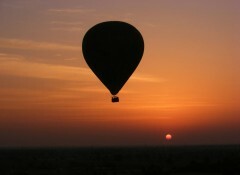 Hot air ballooning in Jaipur is a wind and weather dependant activity. Accordingly, the tour operator reserves the right to cancel or alter the itinerary of the hot air ballooning trip in Jaipur to ensure maximum safety for travellers as well as staff. 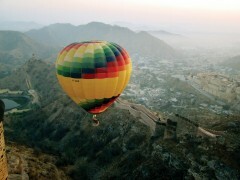 Go hot air ballooning in Jaipur! Arrive at the launch site. Here, you'll be served some refreshments while you watch your hot air balloon being inflated and prepared for your flight. After a short briefing session, you'll board the basket and take off! You'll smoothly float towards the sky, and witness the beautiful sun on the horizon. You'll get a unique view of Jaipur, unlike any other, with the bright colours of the sky contrasting the lakes and mountains below you. 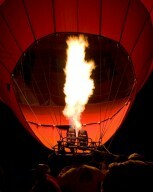 After a 45-60 minute flight, the ballooning pilot will guide the balloon for a landing. Once you touchdown, the pick-up vehicle will be waiting to drop you off back to the end point. Your trip ends here. Jaipur is easily accessible via road, railway and airway. Jaipur has an international airport and a railway station which is connected to all major cities in India. By road, Jaipur is located on the highway no. 8 which connects Delhi and Mumbai. The operator will pick you up from most hotels in Jaipur city and transfer you to the start point and back.